Posted By:Unknown | At:3:45 PM Be the first to comment! Talk about taking a game winning victory! BET scored a major ratings victory last night (Jan.11) with the debut of their first scripted series. 'The Game,' which was previously cancelled in 2008 by The CW and picked up by BET, pulled in 7.7 million viewers to become the cable network's biggest audience for a scripted series debut.Although The New York Times cited dismal ratings as the reason The CW canned the show,'The Game's premiere surpasses ratings for last October's BET Hip Hop Awards, which drew 3.5 million viewers and even the network's tenth annual BET Awards, which drew just over 7 million viewers. It is the second most watched program in the history of the network behind the 2009 BET Awards, which took in 10.6 million viewers. Last night, topics related to the show including 'Tasha Mack,' 'Derwin,' 'Rick Fox,' 'Melanie' 'GameOn' and 'The Game' generated between six and seven of the top-10 Twitter Trending Topics throughout the hour of the show's first broadcast. The dramedy, which follows the relationships of football players -- and the women who love them, was created by 'Girlfriends' creator/producer Mara Brock Akil. Yesterday's episode marked the premiere of the series' fourth season having already aired for three seasons on the CW. 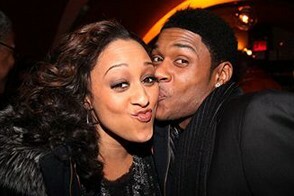 The half-hour sitcom stars Tia Mowry-Hardrict,Pooch Hall, Wendy Raquel Robinson, Coby Bell, Hosea Chanchez, and Brittany Daniel. BET has been very aggressive in their marketing push of 'The Game' airing marathons of the previous three seasons for two consecutive weekends, buying commercial spots on major networks, including FOX, and even showcasing the show at the Television Critics Association's winter show preview last week in Pasadena. The New York Times even did a feature on 'The Game' calling it "more real than reality TV." There were also screening parties held around the country. In addition, the Queen Latifah produced 'Let's Stay Together' drew 4.4 million viewers. It follows the relationship challenges of five young African-Americans. 'The Game' airs on BET Tuesday at 10 pm EST. 'Let's Stay Together' airs immediately after at 10:30pm EST.